The United States Patent and Trademark Office (USPTO) has granted Amazon a new patent that could transform an unmanned aerial vehicle (UAV) into a mini airship. The USTPO published the schematics on March 9, first reported by SlashGear, which shows the UAV will have an inflated membrane and compressed gas chamber containing hydrogen - mounted into its airframe that could be deployed when entering a location where noise reduction is desirable. "This disclosure describes an unmanned aerial vehicle ("UAV") including an inflatable membrane (e.g., a balloon) and a compressed gas chamber containing a gas (e.g., helium, hydrogen, etc.) for inflating the membrane. When the UAV is approaching or departing from a location where noise reduction is desirable (e.g., a delivery location), the membrane may be inflated so as to increase the buoyancy of the UAV and allow the propulsion system (e.g., utilizing propellers, etc.) to be operated with less thrust and correspondingly with less noise. 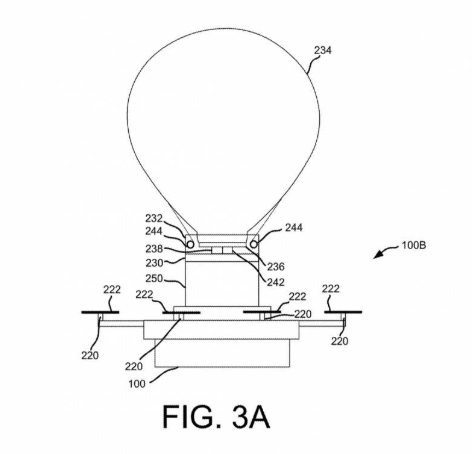 Once the UAV has departed and reached a certain distance from the location, the membrane may be deflated and retracted back into a storage area of the UAV," the patent summary read. The patent doesn't envision flying the drone like the Airlander or Zeppelin, however. The inflatable membrane would be deployed to raise and lower the UAV from the delivery location. The goal behind the technology is to reduce noise and energy in vertical takeoffs and landings. Amazon has had several blimp patents that suggest the company's ambition is to build a mothership. A visualization of one went viral last week, with many social media users believing it was an actual video. 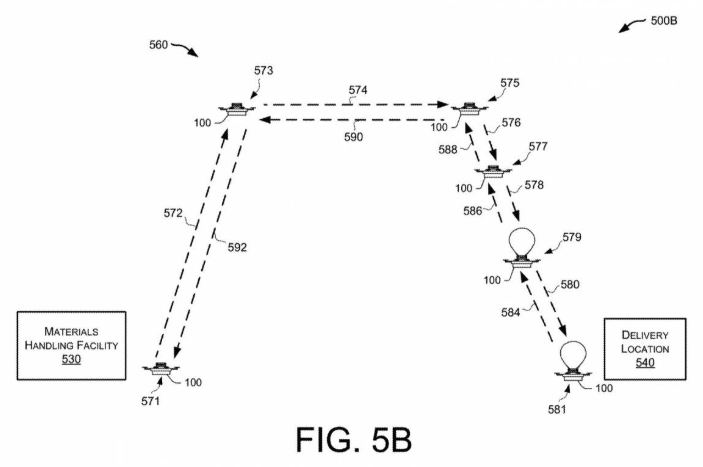 Amazon was also granted a patent that showed delivery drones could drop packages from the sky with parachutes. Another patent describes a self-destructing drone, so if it were to malfunction in the air, the drone would take apart itself to minimize the impact on the ground. Amazon plans to have drones in the sky in the next several years. However, there are significant obstacles the company is facing from US lawmakers who demand drone pilots operate in line-of-sight and have constant communication with air traffic control. Also, the Federal Aviation Administration (FAA) doesn't have a robust framework into regulating commercial drone operations, which has temporarily prevented Amazon from deploying drone services across the U.S.